Fresh Local Produce Delivered RIPE to Your Door! With local, NC apples bountiful and vibrant in color- there is not a more perfect recipe this week than our homemade Apple Crisp. Let’s face it- we are all really busy and don’t have much time to make homemade pie crusts and the ones you can buy at the grocery store, just aren’t as good. 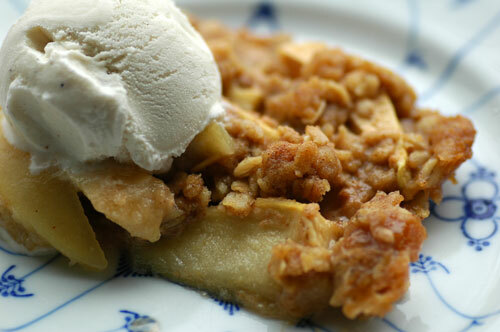 Apple Crisps make an amazingly easy dessert that you can throw together in very little time, but still wow your family and dinner guests. This particular recipe is easily adaptable for all of our Gluten Free folks out there, by simply switching out your oats for certified GF oats and using a GF flour of your choice. Be sure to pick up a pint of our handmade Vanilla ice cream to go on top! Heat the oven to 350°F and arrange a rack in the middle. Lightly coat an 8-by-8-inch glass baking dish with butter. Combine the apples, granulated sugar, cinnamon, and 1/8 teaspoon of the salt in a large bowl and toss to coat. Place the apple mixture in the prepared glass baking dish and set aside. Using the same bowl as for mixing the apples, mix together the brown sugar, oats, flour, and remaining 1/8 teaspoon salt until evenly combined. With your fingertips, blend in the butter pieces until small clumps form and the butter is well incorporated, about 2 minutes. Sprinkle the topping evenly over the apples and bake until the streusel is crispy and the apples are tender, about 50 to 60 minutes. Let cool on a rack at least 30 minutes before serving.